The weather reports indicate each day will be rainy. Luckily for us, the rain has held off until the afternoon each day, so as early risers we are able to seize the best part of each day. Since Sicilia is such an outdoor-oriented place, we are blessed, because an entire week of museums was not the plan. Windmills near Mozia, in the salt pans of Western Italy. 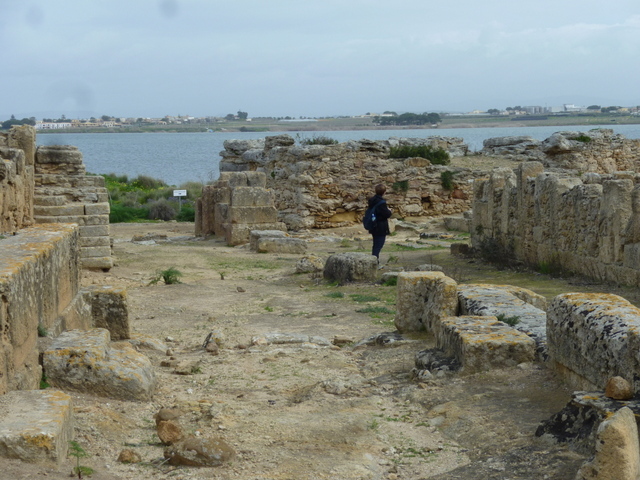 We ventured to tiny Mozia, once an important site for Phoenician traders and a very affluent city in its time, today it is an uninhabited island in the midst of the salt pans of western Sicilia. Once again we are awestruck by the history – the truly ancient history – of this part of the world. You know the old saying: “A hundred miles is a long distance to a European and 100 years is ancient to an American.” When we encounter a place where construction was begun in the 8th century B.C., it gets our attention. Reached by a small launch in a 10-minute ride from the mainland, there’s a fine little museum and the opportunity to explore the island’s many excavations. 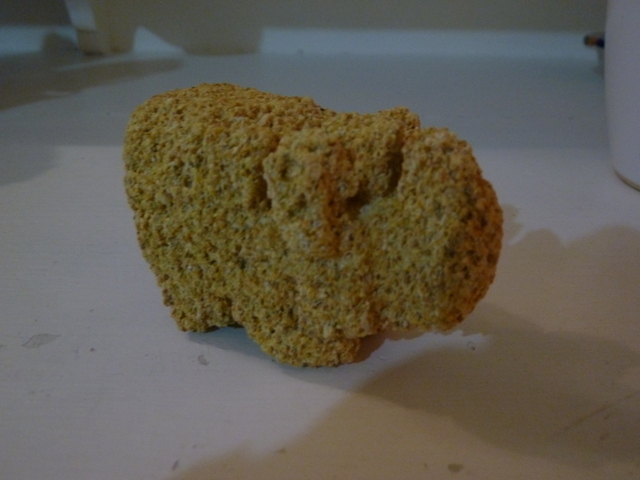 Little tufa elephant carved by Peppe Genna. Perhaps the highlight, though, was meeting Peppe Genna, the “craftsman poet of the saltworks.” Peppe keeps alive ancient traditions of hand-making palm brooms and carving tufa animals, holding court alongside the lagoon, selling his crafts from the trunk of his car. What a character! You can Google him and hear him recite his poetry in Sicilian dialect. 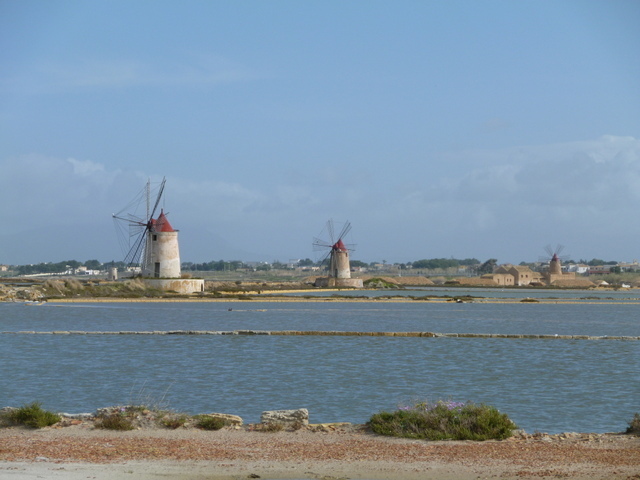 Across the lagoon from Mozia is Marsala, where the Phoenicians retreated when Mozia was destroyed by Siracusa. Of course Marsala is famous for its wines, and it is heavily influenced by North Africa, resulting in a city the looks quite different from any other we have yet encountered in Italy. It has a lovely old center, very clean, with beautiful iron-work balconies. Perhaps not s huge vacation destination, but interesting if you are a) in the area, and b) a fan of Marsala wine. Ruins at Mozia; Yes that’s me in the photo. Erice continues to hide her head from us. As we returned to Tràpani in the afternoon, she briefly cleared, only to be socked-in again before we could mount an approach as it is quite a long drive to the top. 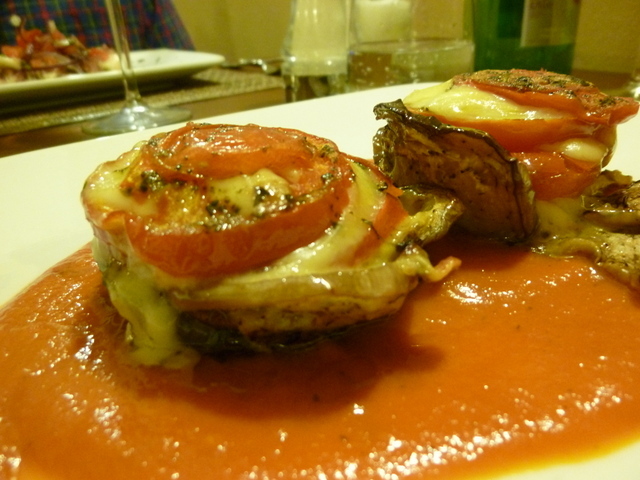 Torta di melanzane, carciofi, pomodori e formaggio. Yum! customers this dreary night, the staff was gracious and the food divine. We feasted on octopus salad, a layered eggplant/tomato/cheese torte, pasta with sea urchins, and pasta alla Norma, prepared with eggplant and artichokes. All washed down with a fine local white wine and the meal rounded out with an almond semifreddo. We slept well after that meal. 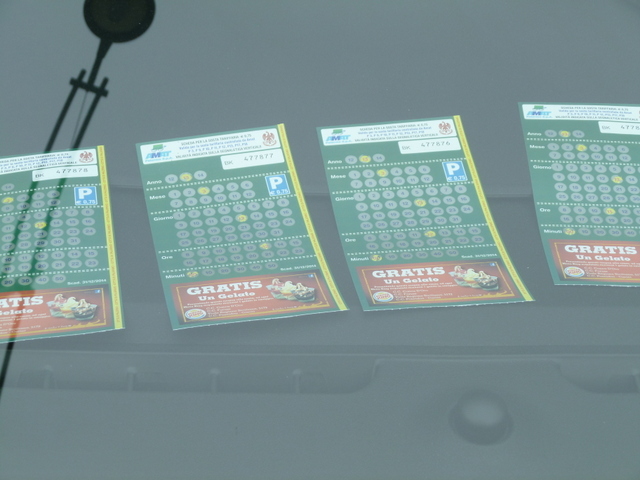 Parking chits look much like lottery tickets in Palermo. much of the city. I knew parking had a “scratch off” system but really didn’t know what to expect. There are no automated ticket vending machines, so I entered a bar and inquired as to where I could buy a ticket. “Da me, signora,” said a soft-spoken, kind man who proceeded to quiz me about our plans for the day and how long we’d park, then explained the system: one ticket per hour paid, free from 14:00-16:00, so I would buy 4 tickets, one for each hour from 11:00-14:00, and 16:00-17:00, then scratch off year, month day and time, and place them on the dash. Interesting system. The parking lot was filled with cars that looked like they had lottery tickets strewn across their dashboards. As far as I can tell, the sweet man in the bar makes €.25 per ticket he sells. Plus the €1.60 we spent on caffé. 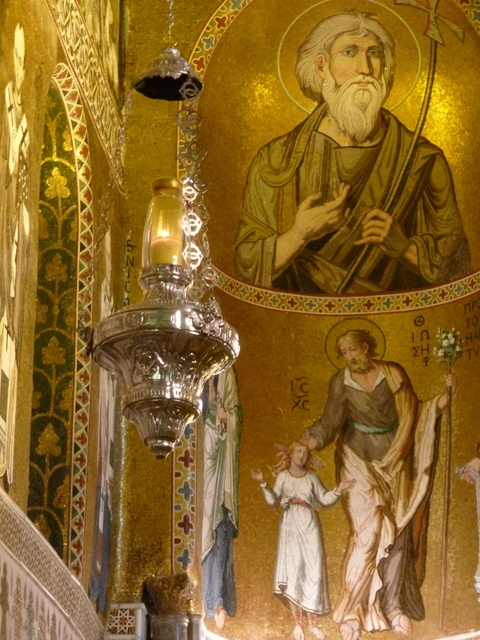 Gold mosaics, Middle Eastern influences, the 12th century Cappella Palatina. Proceeding by metro to the historic center, we browsed Palermo, had lunch, and visited the brilliant and beautiful Cappella Palatina. This is a 12th century masterpiece that combines Byzantine mosaics and Islamic carvings with Latin Christian tradition. Amazing. BTW, no rain until we were returning to Tràpani. Still no Erice in sight. Glad you are enjoying my journeys….and food exploration. I’ll make *polpette di pesce *for you when I come to Portland. The windmill picture looks like a painting! So beautiful! Thanks Gracia! The light was so soft because of moisture. It has that old-world feel. I also loved Palermo!! If you are in the neighborhood where all the ships come in to dock that is the area my family is from! It was my mother’s paternal line that was from there and they were all fishermen! (I did not get that gene)!! Have a wonderful time!! Love to you both!! Laurel, You’re missing all the hub bub in Rome over the new Pope, I understand he was chosen today , from Argentina. Miss you this Spring with your monthly pedi’s. Angela says hello, and Sugar is still as it was when you left. Love your blogs. Hi Mary! We caught the announcement on TV last night. We would not have been in Piazza San Pietro anyway, so the close ups on BBC were enough. This poor man has a huge challenge ahead of him. Say hello to all at Sugar. I miss your pedis, too!